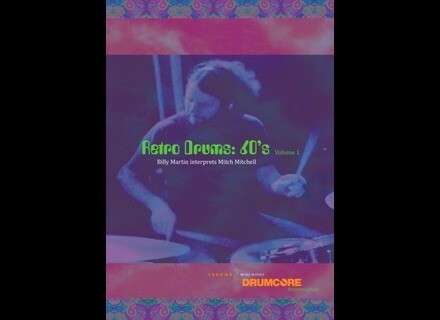 Retro Drums: 60's Volume 1 - Billy Martin Interprets Mitch Mitchell, Drum/Percussion Sample from Sonoma Wire Works. Sonoma Wire Works has released a new DrummerPack for DrumCore: Retro Drums: 60's Volume 1 - Billy Martin Interprets Mitch Mitchell. 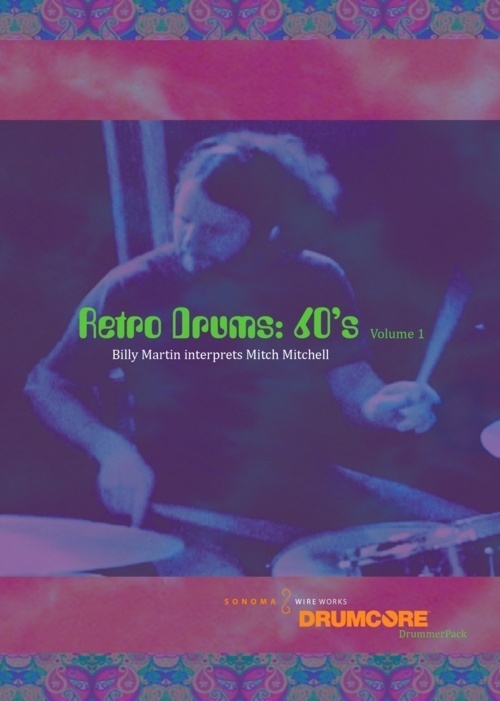 Retro Drums: 60's Volume 1 DrummerPack features 10 Groovesets performed by Billy Martin in the style of legendary Jimi Hendrix Experience drummer Mitch Mitchell. 1960s drums and cymbals (in Mitch's specifications) and vintage recording gear and techniques were used to recreate the classic Mitch Mitchell sound. The live audio drum loops cover a range of stylistic emulations of Mitch's signature grooves and fills, and are presented in stretchable REX format for ease of tempo selection. Variations, fills, intros, stops, and endings are all included for groovy retro drum track creations in your DAW. Also included are 2 Multi-Velocity layered MIDI kits featuring sounds sampled from the vintage '60s kit, as well as MIDI file versions of the grooves and fills represented in this collection. Single hit kit sounds are also available for addition to your audio loops. All audio is 48kHz/24-bit and created in a pro studio using digital (ProTools HD3) and analog (Neumann, Neve, etc.) recording equipment. DrumCore works with most DAWs, and supports dragging audio and MIDI directly to tracks in applications such as ACID 7, Digital Performer 6, Live 6 and up, Logic Pro 8 and up, Pro Tools 7.4.2 and up, Cubase 4 and up (32 bit), and Sonar 8 (32 bit). Drums Used in the DrummerPack: Vintage 1967 (Approx.) Ludwig 3 Ply Drums, 16x22 Bass Drum, 13x9 Mounted Rack Tom, 16x16 Floor Tom, 18x18 Floor Tom, 60's Era Ludwig 5x14 Supraphonic Snare (2), '60s Era Zildjian A Cymbals, 16" Crash, 18" Crash, 20" Crash/Rivet Ride, 20" Ride, 22" Rivet Ride, and 14" Hi Hats. System Requirements: DrumCore 2.5 or higher and 1.6 GB available disk space. Retro Drums: 60's Volume 1 DrummerPack is $79.99 MSRP for the DVD or download. DrumCore 3 is $249 MSRP and is available only on DVD. [NAMM] vst-control.de D50v vst-control.de has announced the release of D50v, a new VST-Controller plug-in for Roland's D50, D550 and VC-1 for V-Synth/VariOS hardware synthesizers. PinkNoise Studio MATRIX PinkNoise Studio has released MATRIX for Kontakt (3.5+), a new sound library based on the best sounds of Oberheim's Matrix 1000 synthesizer. Sound Magic Blue Grand 3D 1.2 Sound Magic has updated Blue Grand3D to version 1.2, a critical update to improve the performance of the piano plug-in.